The title of this work is Pillow (Nevermore). It is a mixed media piece made in 2006. The work was inspired by mourning art. It took the form of a pillow because I was responding to a euphemism for death – sleep, as seen in many variations on gravestone epitaphs, such as “asleep in Jesus” or “At Rest”. I wanted to juxtapose that idea against the regular sleep of dreaming and the subconscious. Another inspiration for Pillow (Nevermore) was the poem, The Raven, by Edgar Allan Poe. Like many others, I’m drawn to the atmosphere of Poe’s stories and poetry - a world of mystery and darkness, and an oppressive sense of time, memory, mourning, anxiety, decay, death, yearning, and unfulfilled desire. A short feature on my Poe-inspired work was published in The Edgar Allan Poe Review, Spring 2008, Volume IX, Number 1, pages 71-3, Penn State Lehigh Valley. The soul effigy, or winged face, came from a rubbing I did in a cemetery in Cape Cod, MA. 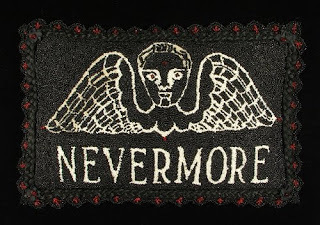 The text originated from a photograph I took of an entryway gate with the word, Nevermore, engraved on it, located in the Garden District of New Orleans, LA. I used doll hair along the border of the pillow as a reference to hairwork in mourning art. 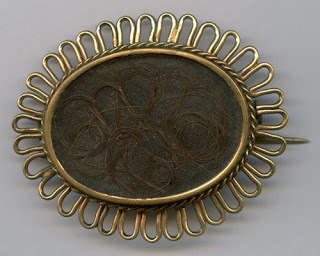 Hairwork was a popular 19th century art form and women made jewelry, flowers, and wreaths from the hair of a deceased loved one as a remembrance or memento mori. 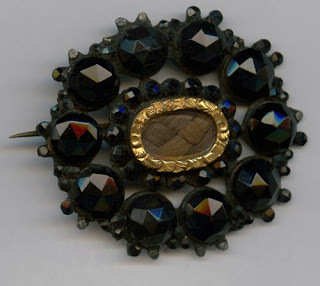 Below are two images from my (very small) collection of 19th century mourning jewelry where hairwork is used. I also used a human hair in Pillow (Nevermore). The single gray human hair that rests on the pillow refers to the ending of William Faulkner’s short story, A Rose for Emily. In the story a “long strand of iron-gray hair” is found on Emily’s pillow, next to the rotting corpse of her sweetheart, whom she had poisoned. Ahhhh…. ain’t love grand?